A tasty, easy-to-make treat for breakfast, lunch or dessert! Place cranberries and apples in large bowl; set aside. Bring apple juice, maple syrup, cinnamon and salt to boil. Pour over cranberries and apples; let sit 15 minutes. Mix oats, pecans, oat bran, wheat germ and sunflower seeds together in separate bowl. Stir into cranberry mixture until blended. Spread onto 15x10x1-inch jelly roll pan. Bake at 300°F (150°C) about 1 hour, stirring every 10 minutes, until golden brown. Remove from oven; cool. Store in sealed container or plastic bag. To Assemble Parfait: Place 1/3 cup yogurt in bottom of parfait glass. 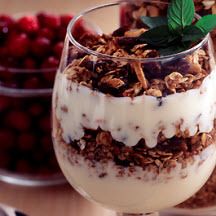 Layer with 1/4 cup granola. Repeat ending with 1/4 cup of granola. Serve immediately. Makes 9 cups granola; 4 parfaits. Nutritional Information Per Serving (2/3 cup yogurt; 1/2 cup granola): Calories: 390; Total Fat: 8g; Saturated Fat: 1g; Total Carbs: 69g; Fiber: 5g; Protein: 14g; Sodium: 240mg. Recipe and photograph courtesy of Cranberry Marketing Committee.